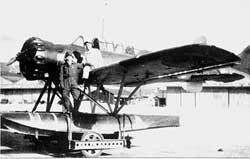 The Yokosuka E14Y (Allied reporting name Glen) was an Imperial Japanese Navy reconnaissance seaplane transported aboard and launched from Japanese submarine aircraft carriers such as the I-25 during World War II. 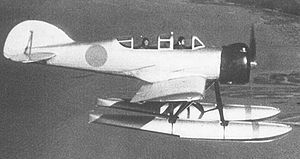 The Japanese Navy designation was "Type 0 Small Reconnaissance Seaplane" (零式小型水上偵察機). The "Glen" was used for several Japanese reconnaissance missions during the Pacific War. 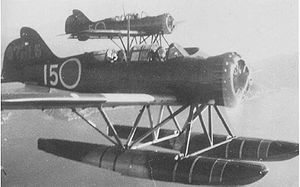 The "Glen" is the only Japanese aircraft to overfly New Zealand during World War II, (and only the second enemy aircraft after the German 'Wolfchen' during World War I). On 8 March 1941 Warrant Officer Nobuo Fujita photographed the Allied build up in Wellington harbour in a "Glen" launched from the Japanese submarine I-25. On 13 March he overflew Auckland, before the I25 proceeded to Australia. On the night of 24/25 May Warrant Officer Susumo Ito flew a "Glen" over Auckland from the Japanese submarine I-21. Type A1 submarine I-9 was caught off the New Zealand coast in early 1943 however no Japanese aircraft was observed and any records of overflights were lost when she was sunk. The "Glenn" also has the distinction of being the only aircraft to drop bombs on the United States mainland during World War II, in an incident known as The Lookout Air Raid. On 9 September 1942 , Chief Warrant Officer Nobuo Fujita, a pilot in the Japanese Imperial Navy, and his crewman, Petty Officer Shoji Okuda, surfaced in submarine I-25 off the coast of Oregon near Brookings. His tiny seaplane had folding wings and was transported in a small hangar attached to the deck of the submarine. The bombs - 76 kg (168 lb) incendiaries intended to cause forest fires - caused no injuries or real damage. A total of 126 planes were produced. Aviation History magazine reported in the Nov. 2008 issue that divers had found airplane parts in the Akibasan Maru wreck, a Japanese cargo ship sunk in the Kwajalein Atoll on 20 January 1944, and rediscovered in 1965. The parts (including wings and floats) have been finally identified (April 2008) as belonging to two E14Y1 "Glen" floatplanes, through the use of photographs from the wreck and comparisons with original technical drawings and a captured technical manual. Green, William. War Planes of the Second World War, Volume Six: Floatplanes. London: Macdonald & Co (Publishers) Ltd., 1962. Ishiguro, Ryusuke and Tadeusz Januszewski. Kugisho E14Y "Glen". Sandomierz, Poland/Redbourn, UK: MMP Books, 2010. ISBN 83-89450-61-6. Jackson, Robert. The Encyclopedia of Military Aircraft. Bath, UK; Parragon Books Ltd., 2006. ISBN 1-40542-465-6. Thorpe, Donald W. Japanese Naval Air Force Camouflage and Markings World War II. Fallbrook, CA: Aero Publishers Inc., 1977. ISBN 0-8168-6587-6.